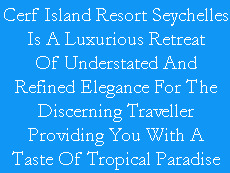 The Cerf Island Resort is a luxury boutique hotel in Seychelles. Most Seychelles hotels are small establishments, ideal for capturing and experiencing the paradise of Seychelles and enjoying the warm hospitality of the hosts. There are few such hotels in the luxury end - The Cerf Island Resort is one of them. Immaculate , uncrowded beaches of powder-soft white sands. 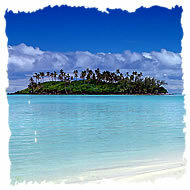 A glorious tropical climate and warm torquoise waters caressing 115 diverse and tranquil islands. A Kaleidoscopic array of untouched forests, bird sanctuaries, exotic hideaways, virgin fishing grounds and spectacular diving spots where few have gone before. Seychelles is all of this and more. Once thought to be the original site of the 'Garden of Eden', the Seychelles archipelago still nurtures unique species of flora and fauna such as the fabulous Coco-de-mer as well as awe-inspiring natural granite structures that date from the dawn of time. With almost half of its limited landmass set aside as nature reserves, one of the highest percentages of any country in the world, Seychelles remains a prestine sanctuary of legendery beauty and immense diversity.